​The Spirit of Love Prayer Charismatic, Ecumenical, Prayer and Praise Community began in the early 1970's. Inspired by the Holy Spirit, it continues to meet weekly. Some 25-50 Christians gather together to center upon Jesus as Lord and Savior and to give praise and thanks for the working of the Holy Spirit in their lives. The group also provides a haven of comfort and healing for many. The prayer group is served through a core group, members who have made a commitment to serve the larger community in such ministries as leaders, music, healing, teaching and hospitality. We invite everyone to come and share with us and experience God's love on any Thursday evening at 7:30 PM. You will always be welcomed. guidance of the Holy Spirit and more. His love heals and calls us to grow. 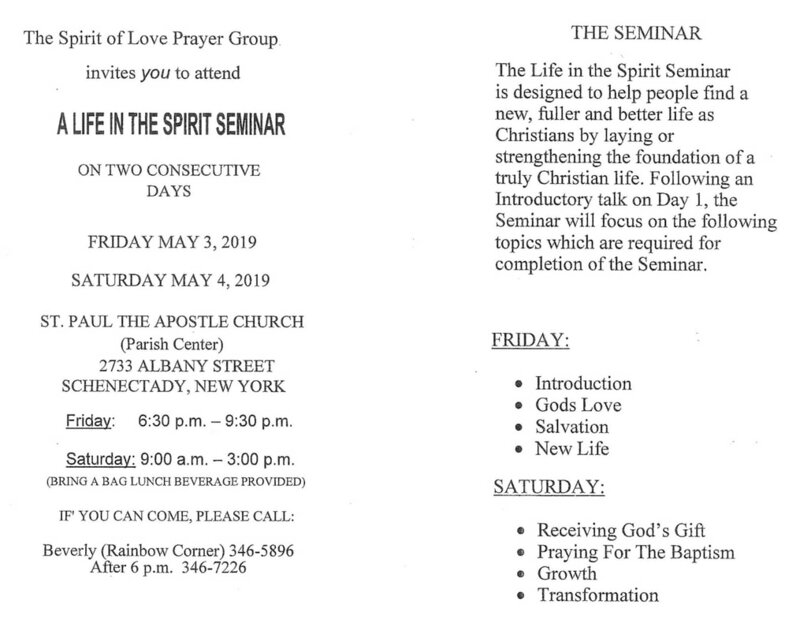 Check St. Paul's bulletin for dates and time of the next Seminar.